Our friend Sebastian completed the Brandenburgs when he was in his mid-thirties during his employment at the court of Anhalt-Cöthen from 1717-1723. During his five and a half years in Cöthen his work as Kappellmeister consisted of composing for and organizing the court’s (secular) instrumental music, as the court was Calvinist and opposed to music in church. Sebastian was a devout Lutheran and the overwhelming majority of his music is religious – if he had not been employed at Cöthen for a few years, most of the music for which he is known today may never have been written. The Cöthen post was Sebastian’s last job before he took up the position of Thomaskantor in Leipzig – which he then held until his death in 1750. It was while at Cöthen that Sebastian’s first wife Maria Barbara died – in the summer of 1720 he accompanied his employer Prince Leopold on a visit to the Karlsbad spa and when he returned home, found that Maria Barbara had died while he was away and been buried on July 7th. Sebastian remarried in December of the following year to Anna Magdalena Wilcke, a professional singer 16 years younger with whom he shared both domestic and musical companionship for the remainder of his life. Many of his solo and chamber instrumental works were composed during this period – or in the case of collections of pieces like The Well-Tempered Clavier, they were conceived and begun at Cöthen. In March of 1719 Sebastian made a trip to Berlin to receive a harpsichord and bring it back to the court at Cöthen, and while he was there met Christian Ludwig, the Margrave of Brandenburg. 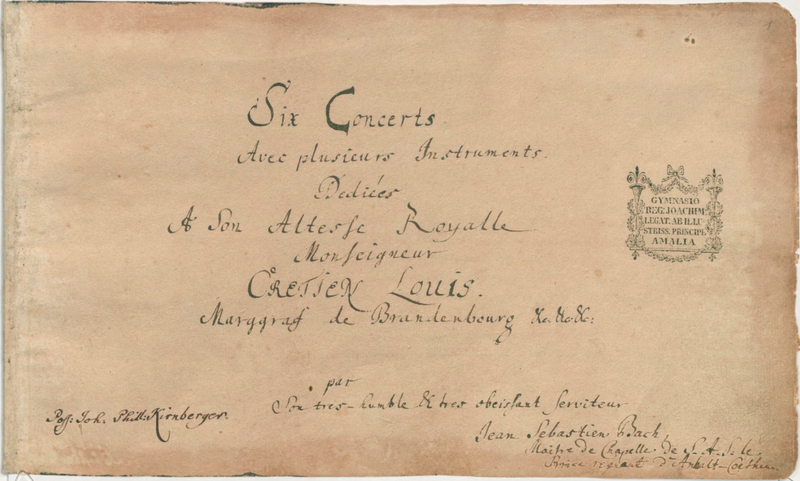 At this meeting Sebastian promised to send some music for Christian Ludwig, a promise he fulfilled two years later in March of 1721 when the Margrave received the score to six chamber concertos. On the title page of the manuscript (now in the Berlin State Library) Sebastian calls them (in fashionable French) “Six Concertos for several Instruments”. Perhaps Sebastian submitted them to the Margrave in hopes of obtaining a post in Berlin but this never materialized. It is ironic that the concertos now bear the Margrave’s name (Brandenburg) in common reference although it is not known that he ever even acknowledged his receipt of the score (he did not pay Sebastian for them), or if they were ever performed in their final form during his or Sebastian’s lifetime. It is possible that they were not performed until after 1850, when they were finally published – a hundred years after Sebastian’s death. 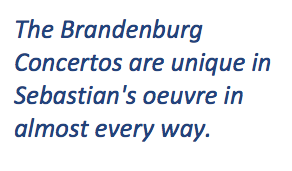 Today, thanks to more than a century of recording technology, The Brandenburg Concertos are firmly established as Sebastian’s most popular works. The six concertos are each constructed in the manner of the concerto grosso, which was the most popular instrumental form of the day. In the concerto form, the music is written to showcase and contrast the qualities of the soloists (concertino) against the entire group (ripieno). Sebastian structured these works to explore virtually all the possibilities inherent in this form of composition – however, each of these six concertos is composed for a different group of instruments from all the others, none of which represent any kind of “standard” instrumentation. In some cases the concertino ensemble outnumbers the ripieno, in fact: Concerto 3, for instance, is scored for 3 violins, 3 violas, and 3 cellos (concertino) with continuo (ripieno) – usually the continuo is performed with one or more bass instruments (often cello + bass) and harpsichord. 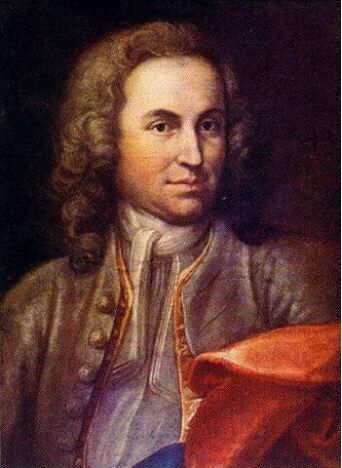 The Brandenburg Concertos remain unique in all the literature today. Sebastian makes unusual and difficult demands on the players too: for instance, in the second concerto, the four soloists are trumpet, violin, oboe, and recorder. Sebastian writes trumpet-like parts for all of the soloists in the outer movements of this concerto. The trumpet is a much louder instrument than all the others, especially the recorder, yet he structures the piece in such a way that every instrument is heard as they weave in and out of the texture of the music. Taken as a whole, these pieces present Sebastian’s ability to write masterfully for a wide variety of instruments and instrumental combinations: in addition to the strings and continuo employed in the ripieno, the Brandenburgs feature as soloists harpsichord, trumpet, two horns, flute, two recorders, oboe, violin, and violino piccolo – a small violin tuned higher than the standard instrument. Concertos 3 and 6, scored for strings alone, employ unusual instruments, combinations, or both: Concerto 3 features nine parts in three sections as described above, and in Concerto 6 no violins are used at all, and two violas da gamba (a nearly obsolete instrument in Sebastian’s time) are used in addition to the more conventional violas, cellos, and bass. All six of the concertos are in Major keys, sparkle with rhythmic vitality, and make virtuosic demands on the performers. It is difficult to reconcile the overwhelmingly exuberant impression they make on the listener with the fact that they were completed and compiled together (1, 3, and 6 are thought to have been composed prior to Sebastian’s appointment at Cöthen) during a time in the composer’s life marked by uncertainty and bereavement. This seeming paradox – that Sebastian’s music does not appear to reflect the circumstances of his “outer” life but rather was attuned to the rhythms and impulses of a rich “inner” life unfathomable to most who surrounded him – is a feature of his work repeated throughout his career, and adds a mysterious layer of depth underscoring these sublime masterpieces. By walterbitner in Baroque, Early Music, Nashville Symphony, Orchestral, Our Friend Sebastian on October 5, 2015 . Well that’s amazing. Great piece, thanks, after four years of learning I still have so much to find out about classical music!